﻿ Cantigneaux Michel / Webseries /What does it take to translate the subtitles of "Out with Dad" episodes? of "Out with Dad" episodes into your language? Don't worry, there is no need to wonder about "how do I make the synchonization of the subtitles?" 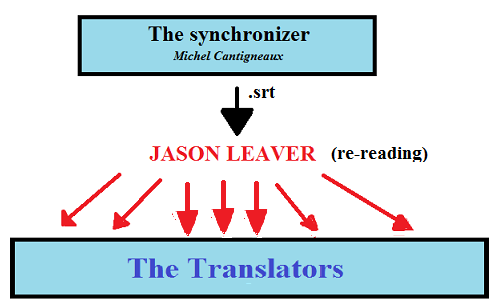 by the synchronizer, presently Michel Cantigneaux (French-speaking Belgian, fluent at English). He prepares a subtitle file, more precisely, called an .srt file. (the name of it ends by "English for Translation.srt"). Jason makes all the corrections he deems necessary. * accessibility to the deaf community. That step includes you if you decide to become a translator of "Out With Dad"
Next to Gwen (& Elina) fo Dutch, Juliane for German and Denise for Brazilian Portuguese . Next to Natiuxx / Hansel (so far) for Spanish, Matilde for Italian, Petr for Czech and Lenia for Greek. and aspiring translator Ahmed for Arabic. It also included Nebojsa for Croatian and "Lyubov" for Russian. New translators in those 2 languages are welcome. 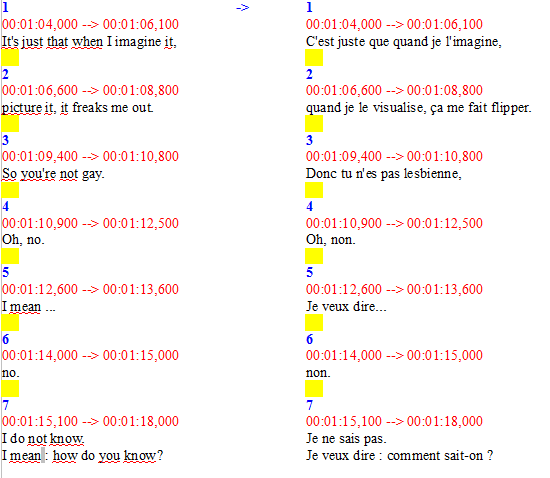 * The French translation file, for he is also our translator for French language. * The Esperanto translation file, for he is also, since recently, our translator for Esperanto language too. The simplest and surer text program to do so is the mere "Windows Notepad", if you have a Windows-operated computer. But any text file reading program works as well in general. Althought these may sometimes generate some trouble-making elements, such as stylized apostrophes. Read very carefully the tips about .srt files gathered into this page. * make the translation on a copy of the file, so you always have the original. * replace for this copy, the file name ending "- English for Translation.srt" by your language name (in English) : "- Greek.srt", "- Spanish.srt". Once done, send it back to Jason Leaver (E-mail address) and Michel (E-mail address). Either of them will upload the subtitles on the video [ as soon as possible to them (Jason is a very busy guy)]. Which languages have we got already? * A new translator for Brazilian Portuguese has recently been found to complete parts of S.3 & S4 (yet done) & Video Diaries in this variant. Rem: so far, the Portuguese subtitles were mainly "Brazilian" subtitles. But a former translator couldn't devote her time anymore. Luckily, a new translator has recently been found and is working on Season 3, to catch up things. Earlier, an European Portuguese translator has been appointed. She yet translated some S.4 episodes. But, on long term, she would translate all the episodes in European Portuguese. * A translator for Arabic had been found but nothing is effective yet, sadly. Which languages would we welcome? Well, any language is welcome, really. * A new translator in Russian is welcome to complete Video Diaries, S3 & S4. * A new translator in Croatian is welcome to complete many episodes of S1, all S2, All Video Diaries, part of S3 & all S4. We don't target any particular language, but Persian, Hindi & Japanese would be major & welcome languages.